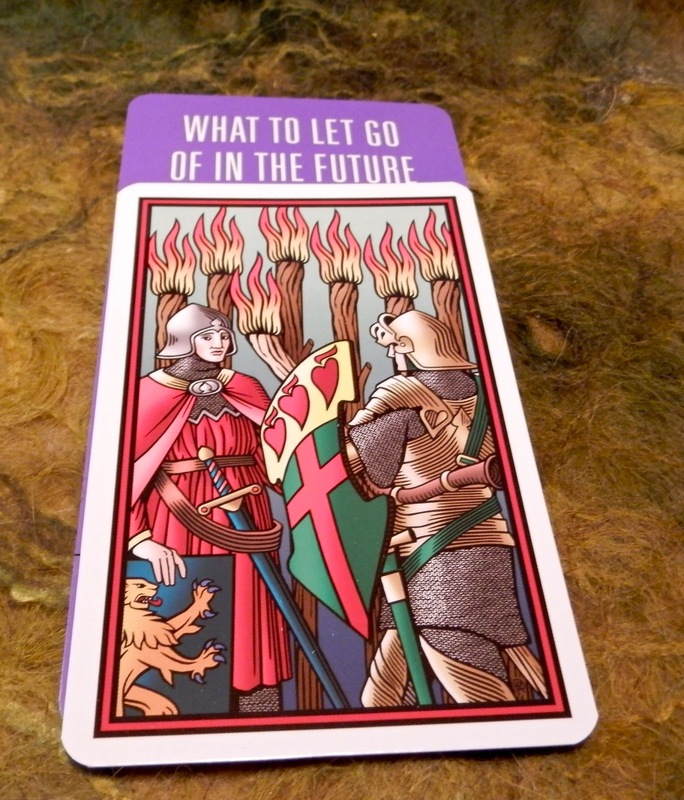 Today's Draw: Seven of Staffs in the What to Let Go Of in the Future position from the Tarot of the Sevenfold Mystery by Robert Place and the Deck of 1000 Spreads. Do you ever yell at telemarketers just because you can? Do you treat those less privileged than you differently than you treat those more privileged than you? Has there ever been a situation in your life when you've been the bully? First of all, for reasons that should be obvious just by looking at this one card, I'm thrilled to have Robert Place's new deck in my grubby little hands at last. He funded this deck through an Indiegogo campaign and it feels like I've been waiting FOREVER. He had a majors only version of this deck that I got a couple of years ago, but there's nothing like having the full deck to play with. His illustrations and colors are just beautiful. So in this deck, he labels the Seven of Staffs as "The Bully". And that's what we're supposed to let go of moving forward. This can be construed as aggression, competition or uncontained anger or passion toward another. People never like to think of themselves as bullies, but I think most, if not all of us, do it at some time or another. Maybe we get passive-aggressive with a cashier who isn't moving fast enough for us. Or we yell at a telemarketer. Or we get touchy with our child after having a bad day. Anytime there is a power differential and we treat the person "beneath" us differently than we'd treat our boss or someone "above us", like it or not, we're being a bully. And that "beneath us" thing could even be someone who is less well liked than us, quieter than us, more meek than us, or someone who is in want of our forgiveness. Sometimes the power differential also comes in the form of more people being on your side. So, like, say you're at a pro-choice rally and you're nasty to the handful of pro-lifers who show up...haha. That's being a bully. I've also seen people justify being a bully because the person they're bullying is a bully. That's being a bully, too. This card showing up in the What to Let Go of in the Future position is calling us to be aware of when there are power differentials, whether they're one-time situational things (the pro-choice mob) or whether it's a more permanent thing (boss/employee). And when there are power differentials, to be aware of the power we wield simply because we are in a place of power. Ideally we should treat all people equal, but it could also be argued that we should be more careful of how we deal with those who hold less power than we. So if you treat your employee differently than you'd treat your boss, you're doing it wrong. If you respond differently to the sour person online than you would respond to the sour person who lives two doors down, you're doing it wrong. If you're acting differently because you're part of a group than you would act on your own, you're doing it wrong. And if you're acting poorly toward someone because they acted poorly toward you, sorry, but you're doing it wrong. At some point in our spiritual journey, we have to make the leap to showing kindness and respect to others, regardless. Society and the Bible teach us the law of an eye for an eye. But Jesus and Buddha do not. They teach us the power of forgiveness, integrity and raising others up to our light through example, rather than lowering ourselves into the darkness. And they also teach us to treat others as we would want to be treated ourselves. These are difficult lessons to learn because they ask us to be conscious before we act. They ask us to come out of ourselves and consider the other person. They ask to act from a place of self reference, rather than a place reaction to an outside source. And they ask us simply to be a better person than we were the time before. When you think of it as "that cashier was moving too slowly", you can justify being nasty. But when you think it of as "I used my elevated power as a customer to humiliate and embarrass this speed-challenged cashier," it's harder to justify and continue. Continuing with the former won't make you any different from many of the people who walk this earth, nor will it cancel your entry to heaven. The only tangible consequence is that you may feel bad about doing it afterward. But in spiritual or personal terms, you do continue to let this cycle of anger and guilt churn on in yourself. Doing the latter allows you to transcend that cycle, see it more honestly and understand the situation from a higher plane, one where there is no power differential or different options for response.